Unite Union has welcomed the 50 cent an hour increase in the minimum wage but says that no matter what level the minimum wage reached it is of little benefit unless it is combined with an end to zero hour contracts. Unite is calling on the government to set a target to have the minimum wage progressively increased from its current level of about 50% of the average wage to two-thirds of the average – which was the standard in New Zealand in the past. The entire benefit of a pay rise can be lost for someone on around 20 hours a week if they lose only one hour’s pay. We will be taking a claim for guaranteed hours to be the norm in the negotiations this year with fast food companies and others who have most staff working under what have been dubbed zero-hour contracts because they have no guaranteed minimum number of hours. exposed the reality of “Zero Hour Contracts” for workers and some of the myths used to justify them. Over a thousand fast food union members working for the major brands in New Zealand responded to Unite Union’s online survey, with nearly 700 giving detailed information on their working hours over the previous four weeks. That is the biggest response Unite Union has ever had to a member survey. “Unfortunately it confirms in detail what we already knew from our worksite visits” said Unite Union National Secretary Gerard Hehir. Myth 1: Zero Hours Contracts give workers the flexibility they want. Many fast food workers do want part-time work (although many who are part- time want to be full time – half of all workers wanted additional hours that would take them to 35 hours a week or more). There is a huge difference between regular part-time work with regular hours and a zero hours contract where you only find out your weekly hours and shifts a few days before they start. Fast food companies like the flexibility of zero hours contracts – their workers do not. Myth 2: Zero Hour contracts are jobs where you can’t work for someone else and you have to wait by the phone ready to work at a moments notice. Those are just one type of these contracts. In fact a “zero hours contract” is just what it says: an employment agreement where there are no guaranteed hours, regardless of whether you are told your hours week by week or day by day. Apart from a few salaried managers, all fast food workers are on zero hours contracts, along with tens of thousands of other workers in the hospitality and retail sectors. Our survey showed that fast food workers worked an average of 25.5 weekly rostered hours, but that they also worked an average of 3.2 additional hours at short notice. 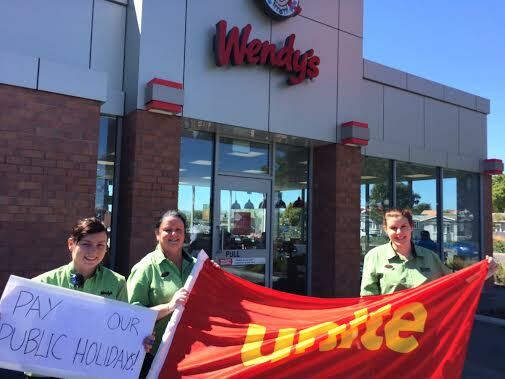 Unite Union has accused the Wendy’s corporation of intimidating workers to stop striking. 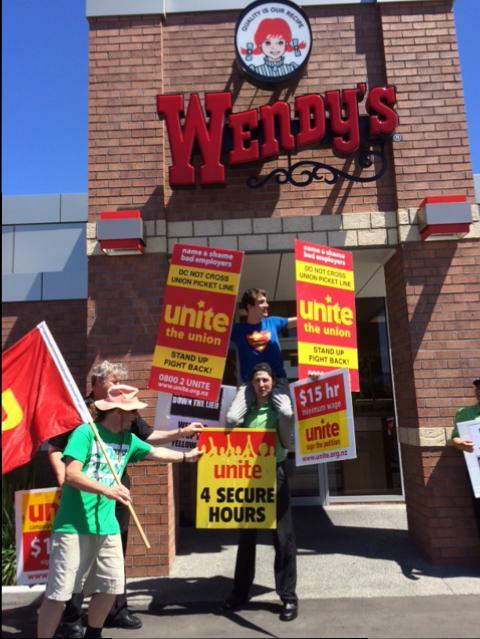 Workers have been pulled aside by managers to caution them against striking "or there would be consequences for their future at Wendy’s". One union delegate was called into a meeting with the company CEO Danielle Lendich and told not to join the strikes. Ironically today has been designated a global day of action in defence of the right to strike by the International Trade Union Confederation. Unite action at Wendy’s is part of the union campaign against zero hour contracts in the industry. The company has written to staff and the public to say that all staff get hours each week but what they don’t say is that most staff have zero hours guaranteed. 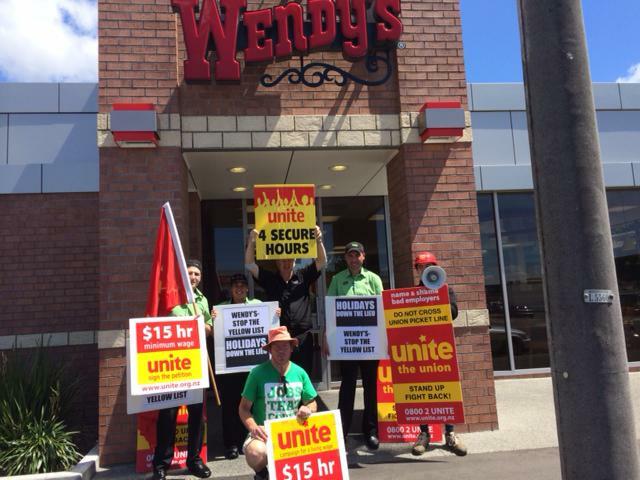 The only group of workers with guaranteed hours at Wendy’s are those with two years service and "open availability" over six or seven days in the week. Workers in Indonesia and the Philippines took action to support the New Zealand fast food workers in their campaign against zero hour contracts by holding solidarity pickets outs9ide local McDonald’s store in both countries. Messages of support were also received from Kong Kong and Korean union activists involved in the international campaign to win union rights in the fast food industry. 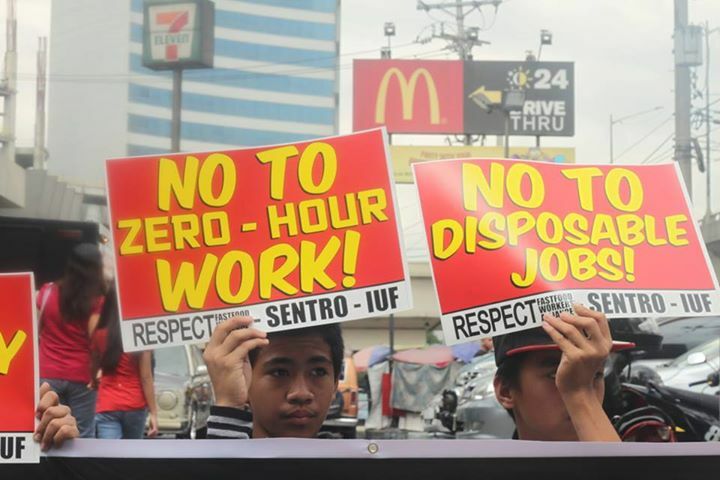 VALENTINE’S Day was celebrated today by youth members of the Alliance of Progressive Labor by picketing a bustling McDonald’s outlet in Quezon City as part of the Philippine leg of the international campaign against “zero hour” work contracts.